April 15, 2019 at 11:23 am PDT May contain affiliate links. Read disclosure. (Deal ends when coupon or cash back expire) Target shoppers! Head to your local stores where you can score CeraVe Hydrating Facial Cleanser for FREE + 83¢ Moneymaker! Simply pick up a 3 oz bottle, price match to the Target Online price of $3.17, use one $2 off one CerVe Skincare Printable Coupon and then submit for $2 SavingStar Cash Back to get the deal. If you prefer not to price match, you can still get an awesome deal through April 20th. 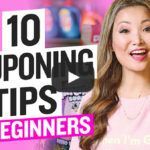 Simply pick up one cleaners, use the 10% off CeraVe Products Cartwheel Offer, use the printable coupon and submit for the SavingStar Cash Back offer to get it for just $1.40! Please note that you cannot use a Cartwheel Offer when price matching.